Tesla CEO Elon Musk has made good on his promise to offer company-owned body shops, with the company’s website listing collision repair facilities in California, Florida, Georgia, Illinois, Maryland, Nevada, Texas and Washington. The body shops can only handle “light collision work,” according to the company’s body shop support webpage. As of Thursday, Tesla had nine locations in eight states: Van Nuys, Calif.; Eatonville, Fla.; Marietta, Ga.; Villa Park, Ill.; Owings Mills, Md. ; Las Vegas, Nev.; Houston and Dallas, Texas; and Bellevue, Wash. The topic of company-owned doesn’t appear to have come up in Tesla’s second-quarter earnings call on Wednesday, according to a transcript from Seeking Alpha. However, Tesla did reiterate that it saw body shops as a source of revenue in its quarterly letter to shareholders. Twitter user Adam Whiting had tweeted that his Model 3 had been hit June 11. Tesla body shops are ramping up fast. Aiming to go from 30+ days using external body repair shops to same day body repair with prestocked parts at Tesla service centers. Hopefully, there’s enough prestocked components to go around that this in-house inventory doesn’t exacerbate parts-related delays at third-party Tesla-certified shops. Other Twitter users complained about parts on the thread, and Whiting also noted, “One other Model 3 at body shop has been waiting on a quarter panel for over 100 days. That’s the main part I’m waiting for. I got escalation to July 27th then was told September 6th when parts didn’t arrive.” He also wrote Tesla would pay for his Enterprise rental as long as it took for the repair. User Marc Goldschmidt, who said he was the other owner, demanded parts as well. Elon, I’m the owner of that other Model 3 that’s been in the Chandler Service Service King body shop since 4/16/2018 and I expect to be serviced along with Adam. Please have the parts sent over for both cars. BTW, I’m also a Model X owner. Tesla touched upon production parts supply briefly during the call, based on the audio and the Seeking Alpha transcript. Musk described situations where a production part was unworkable because it was designed or built wrong or had some other issue. The company therefore had to resort to “low-volume tooling,” which can cost 10 times more than production tooling, he said. 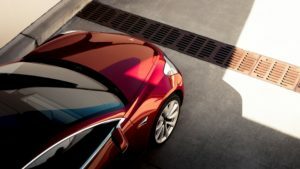 Parts supply is not mentioned in the letter to shareholders, though that document does note that Tesla was able to produce higher volumes of cars than it had been in the past — good news for Tesla-certified shops and perhaps for parts backlogs. Tesla produced 53,339 vehicles in the second quarter and delivered 40,768, they wrote. “In July 2018, we delivered our 200,000th vehicle in the US, which means that our US customers will have access to the full $7,500 federal tax credit until the end of 2018, at which point it will phase out over the course of 2019,” Musk and Ahjua wrote. Tesla “Services and Other” revenue was more than $270.1 million in the quarter, up from nearly $216.2 million the previous year. The company attributed this to “higher used car sales.” Tesla’s “Services and Other” expenses were nearly $386.4 million, up from nearly $271.2 million. Musk and Ajua wrote that the the gross loss was in line with expectations and a decrease from the first quarter.